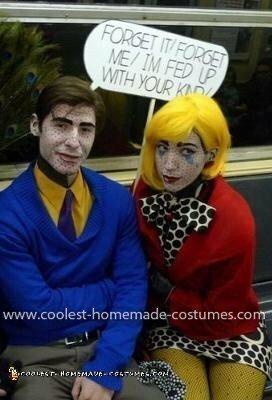 Attached are pictures of one of my favorite costumes to date. After days of brainstorming, my boyfriend finally came up with the idea of a Homemade Roy Lichenstein’s Pop Art Couple Costume and little did we know it was right in front of us! 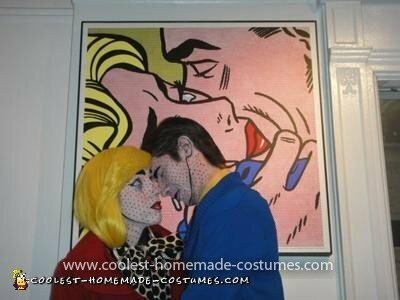 a costume rendition of Roy Lichenstein’s pop art “The Kiss” which I have a copy of framed above my bed. 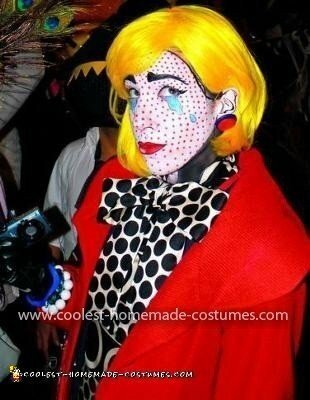 I love costumes that require awesome make up to the point that at the end you can’t really tell it’s you under it all. For the makeup which took a couple of hours to do on myself and my boyfriend, I used wet to dry face paint from Ricky’s NYC. I bought a yellow bob wig which I later styled into a cooler “do” with lots of hairspray. I work in fashion design and my company has a great closet loaded with vintage finds that we use for inspiration where I found this great sixties polka dot dress. 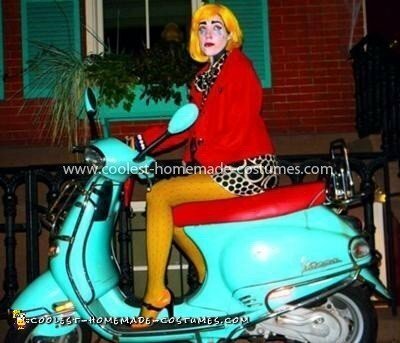 I bought the red “Jackie O” jacket at “Loehmann’s which I returned after Halloween. The tights were layered, yellow on bottom, fishnet on top. The super cute shoes I borrowed from a coworker and the accessories I bought in thrift stores and just piled them on. My boyfriend’s sweater and shirt we found at a cheapy store for like less than $20 altogether and his polka dot tie I found at the Salvation Army for like a buck! Over all, the make up was probably the most impactful aspect of the costume, the outfits just added a bit more.